Starting July 1, 2019, I will be an assistant professor in the School of Information (I School) and Electrical Engineering and Computer Sciences (EECS) at the University of California, Berkeley. I am presently an assistant professor of Computer Science at the University of Illinois (UIUC). My research interests are broadly in building tools for simplifying data analytics, i.e., empowering individuals and teams to leverage and make sense of their datasets more easily, efficiently, and effectively. Aditya Parameswaran is a soon-to-be (starting July 1) Assistant Professor in the School of Information (I School) and Electrical Engineering and Computer Sciences (EECS) at the University of California, Berkeley. Aditya Parameswaran is currently an Assistant Professor in Computer Science at the University of Illinois, Urbana-Champaign. He spent a year as a PostDoc at MIT CSAIL following his PhD at Stanford University, before starting at Illinois in August 2014. He develops systems and algorithms for "human-in-the-loop" data analytics, synthesizing techniques from database systems, data mining, and human computation. He has received the Army Research Office Young Investigator Program Award (2018), the NSF CAREER Award (2017), the TCDE Early Career Award (2017), the Dean's Excellence in Research Award (2018) and the C. W. Gear Junior Faculty Award from the University of Illinois (2017), multiple "best" Doctoral Dissertation Awards (from SIGMOD, SIGKDD, and Stanford in 2014), "Excellent" teacher awards from Illinois (2015, 2017), a Google faculty award (2015) and focused research award (2017), the Key Scientific Challenges award from Yahoo!, six best-of-conference citations (VLDB 2010, KDD 2012, ICDE 2014, ICDE 2016, AISTATS 2017, VLDB 2017), and a best demo honorable mention (SIGMOD 2017). He is an associate editor of SIGMOD Record, serves on the steering committee of the HILDA (Human-in-the-loop Data Analytics) Workshop @ SIGMOD and the DSIA (Data Systems for Interactive Analysis) Workshop @ VIS, and has served on program committees of various database, data mining, web, systems, and crowdsourcing conferences. His research group is supported with funding from the NSF (CAREER, Medium, AITF, BigData), the NIH (2X), the Army Research Office, the Toyota Research Institute, Adobe, the Siebel Energy Institute, and Google. —, 2019: *BIG NEWS! * I am moving to UC Berkeley, starting early Summer, with a faculty appointment at the School of Information and the EECS Department. Berkeley has been making some exciting moves in the broad data and information space, including a new Division of Data Science and Information, a very popular Masters in Information and Data Science program, and a new and increasingly popular data science major. I'm looking forward to being a part of this journey, and to moving back to the Bay Area! Illinois has been a wonderful home for the past 5-odd years with terrific students, a collegial research environment, and Midwestern charm (plus baby goats! ); I'm going to miss my colleagues, the university, and the town terribly. March 20, 2019: Silu Huang accepted her offer to be a researcher at the DMX group at Microsoft Research! I interned in the DMX group back in 2010 and it's a fantastic place to work. March 15, 2019: DataSpread's asynch computation framework was accepted at SIGMOD'19. Congrats to Mangesh, Tana et al.! 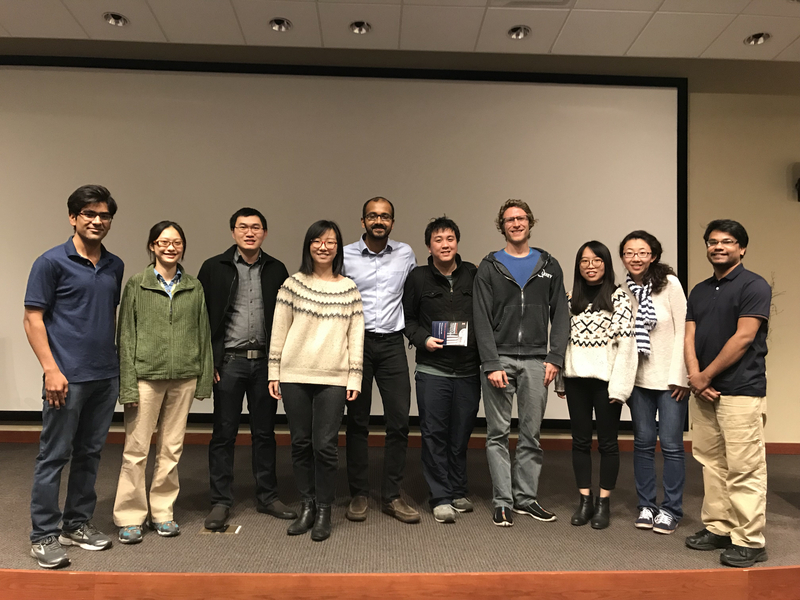 March 1, 2019: Yihan Gao defended his thesis on data compression and data extraction, titled "Extracting and Utilizing Hidden Structures in Large Datasets". Yihan will return to his undergraduate alma mater to be an assistant professor at Tsinghua University. Congratulations Yihan! February 10, 2019: Our demo paper on DataSpread's navigation, formula, and relational capabilities was accepted at ICDE'19. Congrats Mangesh, Tana, Sajjadur, and gang! 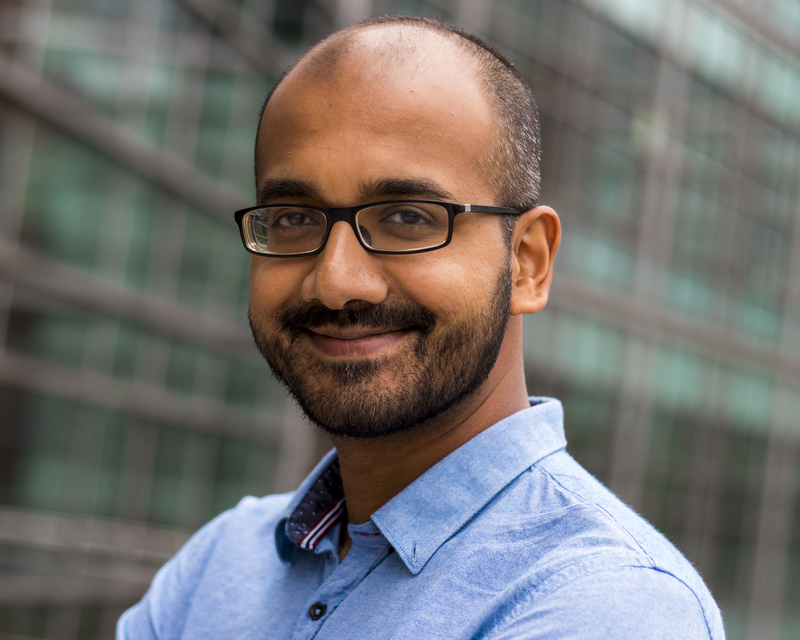 February 1, 2019: Mangesh Bendre is leaving the group to start as a research scientist at Visa Research. Congratulations Mangesh! Mangesh's thesis on DataSpread is up at this link. December 15, 2018: Congratulations to Doris and gang for our IUI 2019 paper (link here) identifying a new fallacy in data exploration-the drill-down fallacy-and developing techniques to work around it. December 1, 2018: Yay! My student Mangesh Bendre (coadvised with Kevin Chang) defended his thesis on DataSpread. Mangesh has spearheaded the development of DataSpread, and was instrumental in many of the key innovations so far: the hybrid data model, positional indexing, and asynchronous formula computation. November 15, 2018: Congrats to Doris and the rest of the Helix team for the VLDB 2019 paper on the design of Helix, our human-in-the-loop machine learning system. August 13, 2018: Congratulations to Silu, Liqi et al. (w/ Aaron Elmore) for a "best of conference" nomination for our VLDB 2017 paper on our versioned database system Orpheus's design and implementation! August 13, 2018: Doris's IEEE D.E. Bulletin paper articulating our vision for a visual discovery assistant, called VIDA, will be out soon. Thanks to Alexandra for inviting us. August 10, 2018: Shreya's paper on incorporating constraints for more accurate crowd-powered sorting was accepted as a short paper at CIKM 2018. July 11, 2018: Thrilled to receive the Army Research Office Young Investigator Program Award for our work on decoupling perspectives in crowdsourcing. Thanks to the CS Department for the generous article! June 30, 2018: Our SIGMOD blog post on why visual data exploration introduces a number of new data management challenges is up. Thank you to Georgia Koutrika for inviting me! June 15, 2018: Our project page for Helix is up! June 15, 2018: Short papers accepted at IDEA on iteration in machine learning workflows, and at HCOMP on quality evaluation methods for crowdsourced segmentation. May 27, 2018: I am serving on the steering committee of the DSIA workshop @ VIS 2018. Consider submitting your latest and greatest work here! May 2, 2018: Demos on Helix, our human-in-the-loop machine learning tool, and ShapeSearch, our flexible shape-based trend-line querying tool, were accepted at VLDB 2018. April 25, 2018: Our paper on Needletail, an efficient sampling engine for browsing, was accepted at the HILDA Workshop at SIGMOD 2018. We've used Needletail in a number of papers on scalable approximate visualization generation, so we're glad to have this finally out there! April 15, 2018: Our paper on accelerating human-in-the-loop ML, a vision paper for the Helix project, was accepted at the DEEM Workshop at SIGMOD 2018. Lots more to come on Helix in the near future. Congrats Doris! April 1, 2018: Thrilled to receive the 2018 Dean's Excellence in Research Award from the University of Illinois, given to assistant professors with an outstanding research profile + impact. Delighted to be able to celebrate with the group (photo on the right)! March 1, 2018: Happy to be recognized with a spot on the "List of teachers rated as Excellent" for the second year in a row! February 15, 2018: Our demo paper (w/ folks at UChicago) on generating succinct diffs between data versions was accepted at SIGMOD 2018. February 10, 2018: Mangesh's paper on data models and indexes for scalable spreadsheets has been accepted to ICDE 2018! This paper lays out the groundwork for our DataSpread project, many years in the making. December 12, 2017: New paper on quickly identifying a succinct difference (or "diff") between two relational datasets here. We characterize the complexity of this problem, based on varying the classes of operators and types of attributes. December 10, 2017: More Kelly news! Kelly received the Snap Research Scholarshop and the CRA Undergraduate research award honorable mention. Woohoo! December 1, 2017: Interested in trying out our latest version of Zenvisage? Here's the link: zenvisage.cs.illinois.edu. More at our Medium blog post. November 18, 2017: Paper studying scalability issues in Microsoft Excel by analyzing a large collection of Reddit posts, accepted at CHI 2018. Congrats Kelly Mack (an amazing achievement for an undergrad)! In other news, Kelly was also nominated for the CRA undergraduate research award. November 10, 2017: Paper on our automatic data lake extraction tool accepted at SIGMOD 2018. Our tool automatically identifies the components corresponding to formatting and filters it out to extract a structured representation, with high accuracies on log files from github. Congrats Yihan and Silu! October 15, 2017: My O'Reilly Blog post on "Enabling Data Science for the Majority" is live! In here, I articulate that there are 5 BIG challenges in democratizing data science, and describe some of our work as well as some of the other work in this space. Read this if you want to find out what's new and cool in data science research. October 10, 2017: New preprint on characterizing the spectrum of scalability issues in Microsoft Excel via Reddit posts here as part of our DataSpread project. Led by Kelly, our intrepid undergrad! October 1, 2017: The Zenvisage gang chronicle our multi-year effort in participatory design with Zenvisage along with scientists from material science, genetics, and astrophysics is chronicled here. Many interesting insights on how visual exploration systems like Zenvisage can fit into scientific data exploration workflows + many real instances of valuable scientific findings gained from the process! September 11, 2017: Thanks to new funding from the NSF Algorithms in the Field (AitF) program, we can advance scalable visualization by applying sublinear time techniques, along with the super smart theory duo of Ronitt Rubinfeld (MIT) and Ilias Diakonikolas (USC). NSF page here. "Drawing Conclusions Early with Incvisage", here. "Painless Data Versioning for Collaborative Data Science", here. "Crowdsourcing in Practice: Our Findings", here. August 15, 2017: Grateful to receive the C.W. Gear Junior Faculty Award from the University of Illinois! Thanks to the Department of CS for being such a supportive environment for junior faculty! on Needletail, our "any-k" browsing and sampling engine, here. on FastMatch, an algorithm for rapidly matching histograms to a target, applying a variety of systems and algorithmic ideas, here; a key component of Zenvisage. on DataSpread, studying representation and indexing schemes for spreadsheet data, here. on Catamaran (formerly known as Datamaran), our unsupervised extraction tool for large-scale extraction from data lakes, here. May 18, 2017: The OrpheusDB demo received a best demo honorable mention! Congrats to Liqi + Silu! Missed it at SIGMOD? You can still catch it here: video. The NSF CAREER Award: Abstract here. Excited to pursue the vision of optimizing "open-ended" crowdsourcing! Vision paper from IEEE Data Engg. Bulletin here. The TCDE (Technical Committed on Data Engineering) Early Career Award, awarded for an individual's whole body of work in the first 5 years after the PhD. The award citation: The award is for developing new interactive tools and techniques that expand the reach of data analytics, enabling powerful data-driven discoveries by experts and non-experts alike. April 15, 2017: Orpheus Updates: demo accepted at SIGMOD 2017; paper accepted at VLDB 2017 (no revisions! ); open-source release here. April 3, 2017: The New York Times cited Adam Marcus and my book on crowdsourced data management. Article here. April 3, 2017: The HILDA 2017 workshop (co-located with SIGMOD) program is up. March 1, 2017: Manas's TKDE paper on smart drill-down (from the "best of ICDE 2016") was accepted. February 20, 2017: Vision paper on next-gen visualization recommendation systems with Manasi Vartak, Sam et al. is out at SIGMOD Record. Link here. January 30, 2017: My student Silu Huang won the MSR Faculty Fellowship: the first Illinois student since 2011! A great honor! Silu has been recently working on Orpheus. January 30, 2017: Yihan's paper on calibrating classifiers has been accepted as an ORAL presentation at AISTATS'17! January 15, 2017: Our paper analyzing a very large log of all tasks from a popular crowdsourcing marketplace has been accepted at VLDB'17. Learn all about how a marketplace operates, what the distribution of tasks look like, and how the workers behave here. January 10, 2017: Three of our key analytics tools, DataSpread, Zenvisage, and OrpheusDB, are moving out of private betas with a few interested parties to the public, available for easy download and deployment. More details and download links here: http://tiny.cc/three-tools. January 1, 2017: New preprint release on Catamaran (formerly known as Datamaran), our new fully-unsupervised data extraction tool from machine generated data: no examples or supervision needed! Preprint here. Our paper on SlimFast: a data fusion algorithm, spearheaded by Theo Rekatsinas has been accepted at SIGMOD'17! Our vision paper on Open-Ended Crowdsourcing was accepted to appear at the IEEE data engineering bulletin, spearheaded by the amazing Tova Milo. December 1, 2016: I've given a bunch of talks on our three tools for human-in-the-loop data analytics: a distinguished colloquium at Northwestern, a keynote at the Enterprise Intelligence workshop at KDD'16, and BigData events at Illinois and Chicago. Grab the slides here. December 1, 2016: My exceptional PhD student, Silu Huang, was a finalist in the prestigious Microsoft Research PhD fellowship competition, with an in-person interview at MSR HQ -- so proud of her! Fingers crossed for the eventual outcome. From the Zenvisage project: a paper on visualizations that incrementally improve over time, and a paper on our rapid sampling engine for visualizations. From the Orpheus project: a paper describing data models and partitioning schemes for relational dataset versioning. From the Populace project: a paper on consensus-based clustering of unstructured data. From the DataSpread project: a paper evaluating representation schemes and indexing structures for billion cell spreadsheets. November 15, 2016: We delivered our tutorial on crowdsourced data management at HCOMP'16: slides part 1 part 2. November 1, 2016: Thanks to Adobe for supporting our research efforts! November 1, 2016: New releases for : a paper on the Zenvisage query language, ZQL and our smart-fuse query optimizer, accepted at VLDB'17 here, plus a demonstration paper accepted at CIDR'17 here. October 15, 2016: I am one of the chairs of the Human-in-the-loop Data Analytics (HILDA) Workshop at SIGMOD'17, along with the peerless Joe Hellerstein, from Berkeley, and Carsten Binnig from Brown. Website here. Follow us on twitter. October 1, 2016: My outstanding MS student, Vipul Venkataraman won the Siebel Scholarship: cool cash prize of $20K. Well-deserved! September 15, 2016: Participated in a fun panel on "Will AI eat us all?" with the eminent team of Sunita Sarawagi, Sihem Amer-Yahia, H. Jagadish, and Ihab Ilyas at VLDB'16. Short answer: no. September 1, 2016: Thanks to NSF for funding our work on DataSpread with an NSF BigData grant. Some Illinois press here. September 1, 2016: Participated in an invited workshop on the "Theory and Models for Crowds and Networks" with an eminent team of researchers in Oaxaca, Mexico. I presented a tutorial on the data management community's take on crowdsourcing. Slides here. , our spreadsheet-database hybrid: here. , our versioned database system: here. , our visualization recommendation system: here. , our project on optimizing crowdsourcing: here. July 15, 2016: Our new paper on producing intelligent summaries of facets of papers, with Xiang Ren, Tarique Siddiqui, and Jiawei Han has been accepted at CIKM 2016! June 20, 2016: Our paper on data exploration at ICDE 2016 was invited to the TKDE "best of conference" issue, an honor reserved for the top few papers at the conference. Great job Manas! June 15, 2016: After two years of extensive collaborations with folks at the two institutes, I am now an "official" affiliate of the Institute for Genomic Biology, and the Beckman Institute for Advanced Science and Technology. June 1, 2016: Our paper on Squish: a tool for compression of relational datasets was accepted at KDD 2016! Our code is open-source and available on Github. May 1, 2016: New release on our visual data exploration platform zenvisage. Paper here, and website dedicated to Zenvisage here. Contact us if you'd like to test run zenvisage on your datasets! April 15, 2016: We just received a seed grant from the Siebel Energy Institute to develop Zenvisage in collaboration with battery scientists at Carnegie Mellon! Excited to see what happens next. April 10, 2016: We received a whopping 3X the number of submissions for the undergraduate research contest. Who knows what these young researchers will accomplish next? April 1, 2016: Our paper on Decibel, the storage engine underlying DataHub, was accepted at SIGMOD 2016! March 1, 2016: Thrilled to be among the "List of Teachers Ranked as Excellent by their Students" at Illinois! Happy to see that students enjoy my classes. January 6, 2016: Adam and I are proud to finally release a book on crowdsourced data management, a labor of love under development for two years. The book not only covers the state of the art, but also contains a survey of both industry users of crowdsourcing and managers of crowdsourcing marketplaces. We hope that this book will be the definitive reference for how crowdsourcing is used in practice. Do send us comments! January 1, 2016: Our vision paper on the unsolved challenges in large-scale data crowdsourcing was accepted at TKDE. December 15, 2015: Our paper on interactive exploration using a more expressive drill-down operator was accepted at ICDE 2016 in Finland. November 25, 2015: Some Illinois press on our NSF-funded DataHub grant. Thrilled and honored to be working with the amazing Sam Madden and Amol Deshpande at solving the problems underlying collaborative data analytics. November 15, 2015: Our paper on optimally managing worker and answer quality in crowdsourcing was accepted at SIGMOD 2016. October 1, 2015: We just heard word that NIH has funded our BD2K commons supplement. Looking forward to working with folks at UChicago to improve data publication workflows! September 15, 2015: Student awesomeness: my student Silu Huang won the 3M foundation fellowship, while Tarique Siddiqui won the Siebel Foundation fellowship. September 1, 2015: Thanks to the NSF, we now have funding to support research and development on DataHub via a Medium IIS grant with MIT and UMD! Link to the project page here. August 1, 2015: The full SeeDB paper has been accepted at VLDB 2016 in India! July 1, 2015: Our JellyBean paper on using humans to count objects in images will appear at HCOMP 2015! June 9, 2015: Release of a new preprint on calibrating the output of confidence estimates from classification algorithms, using classical learning theory tools. This is work driven by my awesome student Yihan Gao. June 6, 2015: Our DataHub query language proposal was accepted at TaPP, a focused provenance workshop. demos: data exploration, Excel-meets-databases, and collaborative data analytics. May 27, 2015: Our paper on versioning principles was accepted at VLDB'15 without any revisions! May 15, 2015: Undergraduate research news: Andrew Kuznetsov, a freshman working in our group won the ISUR undergraduate research prize, and Andrew with two other freshmen -- Andrew Thieck and Radhir Kothuri won the third prize in the Illinois Engineering Open House competition for their crowdsourcing tool. May 12, 2015: Our paper on debiasing was accepted at KDD 2015! April 9, 2015: Our first release of a new project, titled Data-Spread, with my esteemed colleague Kevin Chang and student Mangesh Bendre. Data-Spread is a tool that unifies databases and spreadsheets. You have to see it to believe it! Here is a YouTube video showing Data-Spread in action. Here is our demo paper on Data-Spread. our jellybean paper on counting objects in images; turns out we can do way better than humans or computer vision algorithms! our paper on debiasing of batches; crowdsourcing practitioners often use batching to save costs, but this can lead to non-independence: we deal with this issue. our versioning theory paper; to build a solid foundation for our DataHub project, we explored how to trade off storage and retrieval costs. February 9, 2015: Our paper on exploiting correlations to avoid expensive predicate evaluations was accepted at SIGMOD 2015! February 12, 2015: Many thanks to Google for their support via a Google Faculty Research Award! Excited to be building the next generation visualization toolkit. our paper on gathering data using the crowd, exploiting a hierarchy and MABs. November 10, 2014: Three new paper acceptances in the last month! and our paper on generalized confidence intervals for crowdsourced workers was accepted at ICDE! October 10, 2014: Thrilled to be a part of the new NIH BD2K (Big Data 2 Knowledge) center for revolutionizing genomic data analysis. Thank you, NIH, for the support! September 2, 2014: We can finally talk about our exciting new project, titled Datahub (i.e., GitHub for Data) on collaborative data science and version management. The ambitious goal is to eliminate the pain-points of data book-keeping while doing collaborative data science. September 1, 2014: Our paper on pricing for crowdsourcing tasks has been accepted for presentation at VLDB 2015! The paper studies a simple, but important problem: if you have a batch of tasks and a deadline, how should you vary price to meet the deadline? August 25, 2014: Pleasantly surprised to be selected as the KDD dissertation award runner-up, having already been given the SIGMOD dissertation award! Feel truly lucky to have two communities - SIGMOD and KDD - supporting my work! August 24, 2014: Had a blast being a keynote speaker at KDD IDEA 2014 - a big thank you to the organizers for inviting me! If this year was any indication, IDEA is going to flourish as a workshop for many years! August 20, 2014: Our paper on optimally learning maximum-likelihood worker accuracies has been accepted as a work-in-progress paper for HCOMP 2014! The paper tackles the problem of worker quality estimation in a way EM-based algorithms cannot - by providing optimality guarantees. August 15, 2014: Started at Illinois; exciting times ahead! I am an Associate Editor for SIGMOD Record, focusing on vision articles. Please consider sending us your most controversial and/or interesting papers! I serve on the steering committees of HILDA (Human-in-the-loop Data Analytics) at SIGMOD and DSIA (Data Systems for Interactive Analysis) at VIS. Lots of excitement around this nascent area at the intersection of databases, data mining, and visualization/HCI - join us! This cycle, I am serving as an Area/Associate Chair for HCOMP 2020, VLDB 2020, and SIGMOD 2020, as a Program Committee member for VLDB Demo 2019 and HILDA 2019 (phew!) I've served on the program committees of VLDB, KDD, SIGMOD, WSDM, WWW, SOCC, HCOMP, ICDE, and EDBT, many of them multiple times. I co-organized HILDA 2017. I was the SIGMOD 2016 Undergraduate Research Chair. Zenvisage is a tool for effortlessly visualizing insights from very large data sets. It automates finding the right visualization for a query, significantly simplifying the laborious task of identifying appropriate visualizations. Project page here. Try it live here! Helix accelerates the iterative development of machine learning pipelines with a human developer "in the loop" via intelligent caching and reuse. DataSpread is a tool that marries the best of databases and spreadsheets. DataHub (or "GitHub for Data") is a system that enables collaborative data science by keeping track of large numbers of versions and their dependencies compactly, and allowing users to progressively clean, integrate and visualize their datasets. OrpheusDB is a component of DataHub focused on using a relational database for versioning. Our work has developed a number of algorithms for gathering, processing, and understanding data obtained from humans (or crowds), while minimizing cost, latency, and error. Since 2014, our focus has been on optimizing open-ended crowdsourcing: an understudied and challenging class.